Chromecasts are amazing little devices. Simple to setup and install and they do exactly what it says on the tin. Find something on a device you want to watch, hit cast and connect to the chosen device. Casting it could not be easier! One point of note has always been ‘Cast Tab’. This option has not exactly been as great as every other function on the Chromecast. The Cast Tab button was put in place to give you the option of streaming videos and content directly from the browser on sites that do not have Chromecast support. Up until now you would have quickly discovered that this option almost works but could do better (reminds me of my reports back in Secondary school). Overall, video framerate was pretty poor and did not match up with what was on the tab. Currently it will only work correctly on videos that are running full screen in the tab but this is being worked on so expect things to improve at a reasonable pace. We have included a walk-through to try out Tab casting improvements, it should only take a couple of minutes to setup. 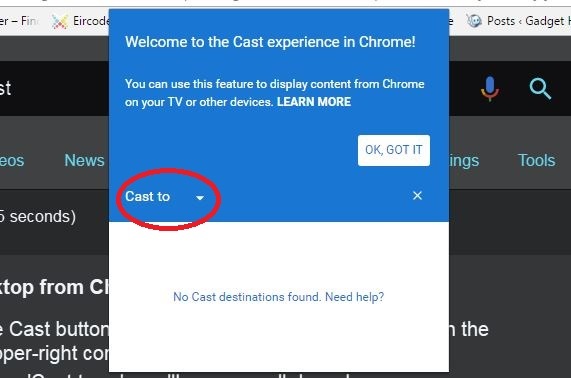 Select the “Cast to” option by clicking the small arrow to the right. 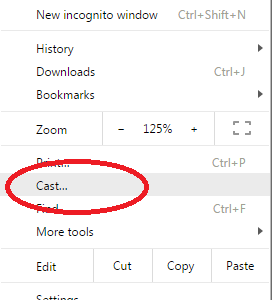 Select “Cast tab” to try this improved feature out. 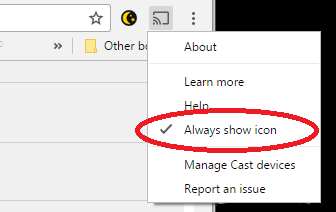 If any of the above options do not show at first, make sure that Chrome is up to date on your device. One thing to bear in mind is that this feature, although executable, is still an experimental one and could break things a little. No need to worry though, if it does this then go back to the address in Step 1 and switch back to “Default”.